Gameplay footage i designed to learn mission implementation in Unreal Engine 4. RPG + Action/Adventure style gameplay with few new features! It took really long time than i expected but i learned alot and now its good enough to show you how the RPG + Action/Adventure style gameplay will look like. Also, Following footage is a test footage.. meaning nothing was intended to be perfect.. This gameplay was only designed to learn the mission implementation in unreal engine 4.. And may or may not exist in actual game release. For the sake of saving time, animation and characters are shown at very basic level with less animation and no facial expression.. music was added afterward just to make it entertaining and will be replaced in actual gameplay if i decide to keep the mission..!! Since this game will support LAN-Play. 2nd player will be able to play with "Skye's (Female) Teammate". And so it's gonna require me to do a little more work before i can put her in the game as working character, which mean its not ready yet and so it was shown as shadow and same goes for the other guy.. Hope you have a good imagination.. You'll also see some stupid looking paintings i did in middle of the video.. And you might also learn few things about main story if you notice carefully..
Below shown the timeline of the mission story i have written already.. 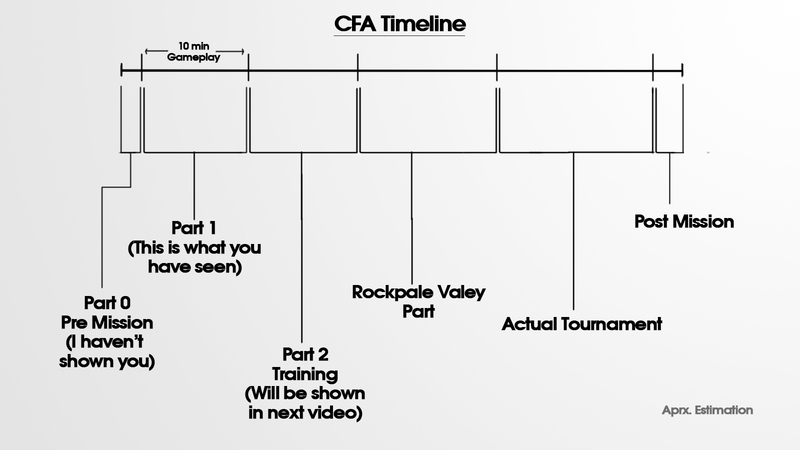 I will most likely create part 2 but after that part 3, 4, 0, and 5 (Post Mission) will only be created if i decide to make full mission.. Truth is, this mission is not suppose to take place in current level.. probably not in the First Chapter at all.. so i might not complete it.. atleast not yet. But i'm gonna complete part 2 which you can expect to come soon.. And judging by the time it took me to create part 1, now you might see how much time consuming it can be to create a full mission including all these parts which might be all around 50-60 minutes of gameplay.. and i'm just one person here.. So i rather focus on Main Mission.. since now i learned how to create one successfully..!! Well, I wish i had mocap and voice actors.. I could have made it a little more interesting.. but maybe i'm asking too much.. Anyways hope you guys enjoyed it... Don't forget to like it and share it among friends.. Great!!! I really like the flashback cinematic part. This is ******* amazing. unreal just like the engine that you alone was able to do this. I applaud you for your hard work and accomplishment. All of your hard work is seen here, all your passion! This is so good! There are NO WORDS to describe how happy I am right now, I cannot wait for this game! Congratulations to you, you are simply incredible! And you have a really good sense for games, for stories and everything!